With the release of Machete, which was based on Robert Rodriguez's fake trailer in Grindhouse we are seeing a resurgence in the exploitation/grindhouse genre. But Machete isn't the only fake trailer that's been turned into a feature length movie. 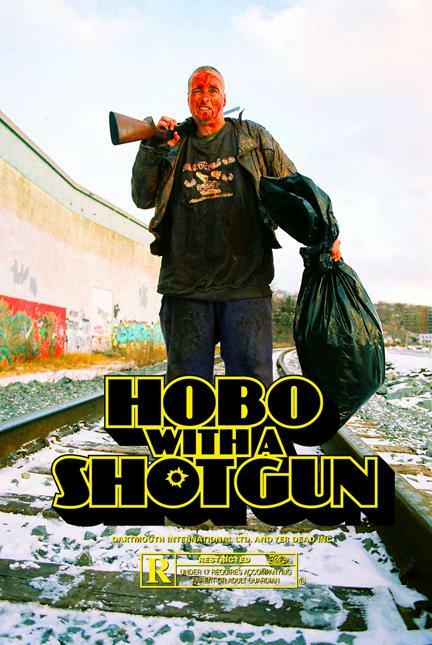 Yup, Hobo with a Shotgun is also becoming a film. If you haven't heard of this film, it was made by Nova Scotia, Canadian filmmakers Jason Eisener, John Davies, and Rob Cotteril. It won Robert Rodriguez's SXSW grindhouse contest and was included in Grindhouse when it was released in Canada. The fake trailer itself is awesome. Check it out below. It has a Troma-ville feel to it. Very much like Street Trash and Combat Shock. This is true blood and guts filth at its finest. We'll see if it can live up to its fake trailer like Machete did. I'm just glad to see a follow Nova Scotian make a go of it. The grindhouse trailers were cute. And it's not a terrible idea for these "veteran" filmmakers to test drive an idea before committing to it. Yet, I'd much prefer to see small fry's like this here Scotian make a feature from a short concept than the already self-indulgent Rodriguez drop the smoke and mirrors and just masterbate all over us (to be fair though, I loved the political "subtext" in Machete). Go independent filmmakers, go! I hear ya David. Both Tarantino and Rodriguez seem to throw grindhouse movies in our face and hope we dig it with the Hollywood glamour on it. I dig these movies though, just full of funnies and nostalgia to hook me...but they make em pretty solidly so I can't complain...ya know? I'm kind of torn with this one so far. It looks like it could be fun but possibly too over-the-top and self aware, kind of like the Japanese new wave of ultra-violent action/gore movies. But Rutger Hauer looks awesome in it, that's for sure!